Adults grieve. So do children. As an adult or child, experiencing grief means to “feel,” not just to “understand.” Anyone old enough to love is old enough to grieve. Even before children are able to talk, they grieve when someone loved passes away. These feelings about the death become a part of their lives forever. Caring adults can help children during this time. If adults are open, honest and loving, experiencing the loss of someone they love this can be a chance for children to learn about both the joy and the pain that comes from caring deeply for other people. Adult sometimes have trouble facing death themselves. Therefore honest discussions about death with children can be difficult. Yet adults who are able to confront, explore and learn from their own personal fears about death can help children when someone loved passes. As a result, children can form a healthy attitude towards both life and death. When a death occurs, children need to be surrounded by feelings of warmth, acceptance and understanding. Caring adults can provide this support. How adults respond when someone loved passes has a major effect on the way children react to the death. Sometimes, adults don’t want to talk about the death, assuming that by doing so children will be spared some of the pain and sadness. The reality is very simple: children will grieve, anyway. Adults who are willing to talk openly about the death help children understand that grief is a natural feeling when someone loved had passes away. Children need adults to confirm that it’s all right to be sad and to cry, and that the hurt they feel now won’t last forever. When ignored, children may suffer more from feeling isolated than from the actual death itself. Worse yet, they could feel all alone in their grief. When someone loved has passed away, adults need to be open, honest and loving. Patiently, they need to answer questions about the death in language children can understand. Adults shouldn’t worry about having all the answers. The answers aren’t as important as the fact that they’re responding to the questions in a way that shows they care. Children may repeat the same questions about the death again and again. It’s natural. Repeating questions and getting answers helps them understand and adjust to the loss of someone loved. Adults often wonder if they should share with children their religious beliefs regarding death. This is a complex issue; no simple guidelines are available. Keep in mind that adults can only share with children those concepts they truly believe. Any religious explanations about death must also be described in concrete terms; children have difficulty understanding abstractions. The theological correctness of the information is less important at this time than the fact that the adult is communicating in a loving way. Create an atmosphere that tells children that their thoughts, fears and wishes will be recognized when someone loved passes away. This recognition includes the right to be part of planning the arrangements for the funeral. Although children may not completely understand the ceremony surrounding the demise, being involved in the planning of the funeral helps establish a sense of comfort and the understanding that life goes on even though someone loved has passed away. Since the funeral of someone loved is a significant event, children should have the same opportunity to attend as any other member of the family. That’s “allowed” to attend, but not “forced.” Explain the purpose of the funeral: as a time to honor the person who has passed; as a time to help, comfort and support each other and as a time to affirm that life goes on. Viewing the body of someone loved who has passed away can also be a positive experience. This provides an opportunity to say “goodbye” and helps children accept the reality of the death. 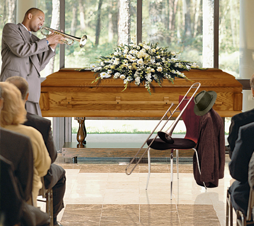 As with attending the funeral, however, seeing the body should not be forced. Grief is complex. It will vary from child to child. Caring adults need to communicate to children that this feeling is not one to be ashamed of or something to hide. Instead, grief is a natural expression of love for the person who passed away. As a caring adult, the challenge is clear. Children do not choose between grieving and not grieving and adults have a choice- to help or not to help children cope with grief. With love and understanding, adults can guide children through this vulnerable time and help make the experience a valuable part of a child’s personal growth and development. Be a good observer. See how each child is behaving. Don’t rush in with explanations. Usually, it’s more helpful to ask exploring questions than to give quick answers. When someone loved passes away, don’t expect children’s reactions to be obvious and immediate. Be patient and be available. Children are part of the family, too. Reassurance comes from the presence of loving people. Children feel secure in the care of gentle arms and tenderness. When describing the death of someone loved to a child, use simple and direct language. Be honest. Express your own feelings regarding the death. By doing so, children have a model for expressing their own feelings. It’s all right to cry, too. Allow children to express a full range of feelings. Anger, guilt, despair and protest are natural reactions to the death of someone loved. Listen to children, don’t just talk to them. No one procedure or formula will fit all children, either at the time of demise or during the months that follow. Be patient, flexible and adjust to individual needs. Adults must recognize their own personal feelings about death. Until adults consciously explore their own concerns, doubts, and fears about death, it will be difficult to support children when someone loved passes.